We all know the type. They’re glamorous, charming, demanding, and you love them to pieces. Well, they needs some training to harness that power for the good of mankind, so why not send them to someplace that understands their unique requirements. Send them to the Princess Fantasy Faire in Disneyland and your children can learn to unlock their true Princess or Knightly potential! Join me to see what we found when we checked out their offerings - including the Royal Coronation Ceremony- to see how this could be accomplished! Since Zoe had a rare occasion where she actually wanted to dress as a princess for a visit to Disneyland, we thought it would be a prime opportunity to hit up all the princessy spots. The biggest of all is the Princess Fantasy Faire, which sits just to the side, off Small World Plaza, next to the Fantasyland Train Station. The area was once called the Fantasyland Theater and hosted some amazing productions. Now, it serves as a central clearing house for all things princess-related, as well as hosting a quick, counter-service eatery – the Troubador Tavern. 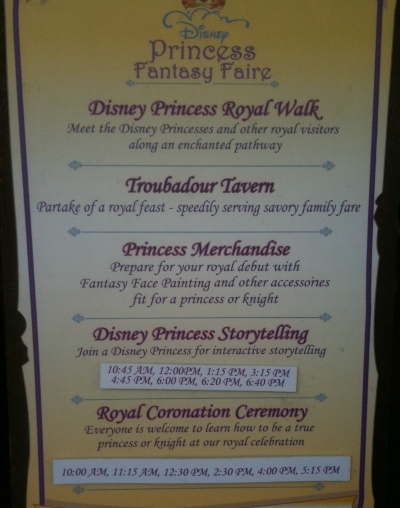 When you arrive at the Fantasy Faire, you will find a schedule of activities and events to be found in the theater area. 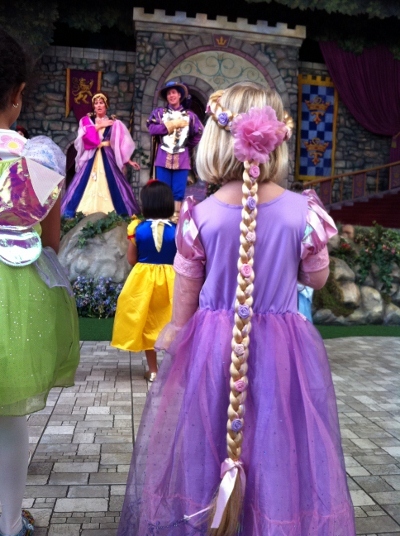 Several of your favorite Disney Princesses can be visited throughout the day at the Royal Walk. If you want to visit them and your little one has their heart set on meeting a specific princess, it is important to note that their presence cannot be guaranteed and you should prepare children for that fact. For instance, when the Storytelling or the Royal Coronation Ceremony happens, the princesses that participate will be away from the walk. Other Princesses come to take their places, so there is always a good selection. The princesses that will appear at various times on the Royal Walk are Cinderella, Mulan, Aurora, Jasmine, Snow White, Belle, Tiana, and even Princess Minnie. Another thing to prepare for is the length of the line for the Royal Walk. Due to its popularity, the wait time is often 30-45 minutes long during normal times and longer in peak season. During your wait, the Princesses may exchange places due to their other obligations, so the group that was greeting guests when you joined the line will probably not be the same as the ones you end up meeting. The Royal Walk is designed so that you cannot see the Princesses until you are invited into the walk, so you won’t know who is inside until you ask the host at the entrance. If the lines are particularly long, one parent can take children over to the merchandise area for accessories and facepainting while the other waits. 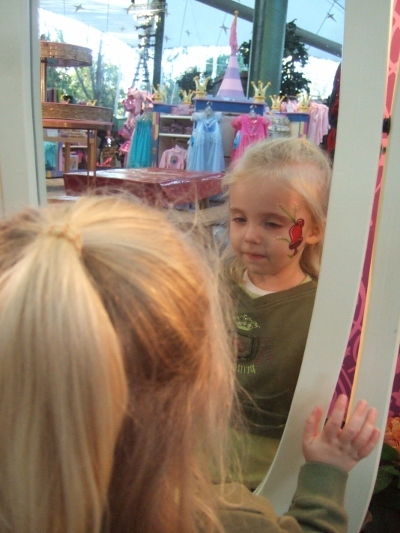 There are a wide variety of facepainting designs under $15 and touch ups are free at any location in the park, so there are no worries if there are smudges or tear-stains. Even the crankiest youngster will have smiles at the sight of the finished product. Once you’ve had your personal visit in the Walk, descend down into the theater to take part in the Royal Coronation Ceremony. 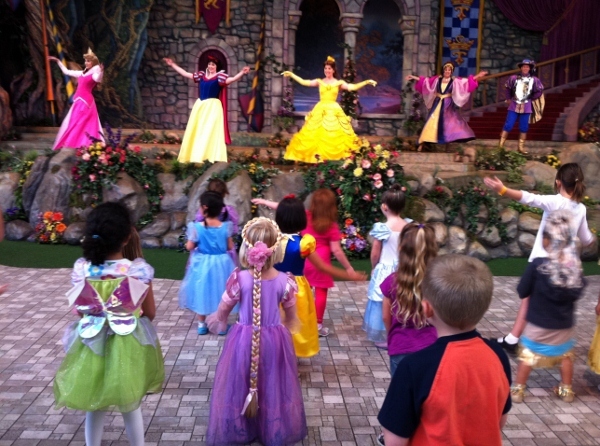 In this interactive show, your children will get first-hand lessons on the manners that will make them good princesses and knights. The lesson starts with a song and dance, and is followed by taking a special pledge to be the best and most honorable person they can be. 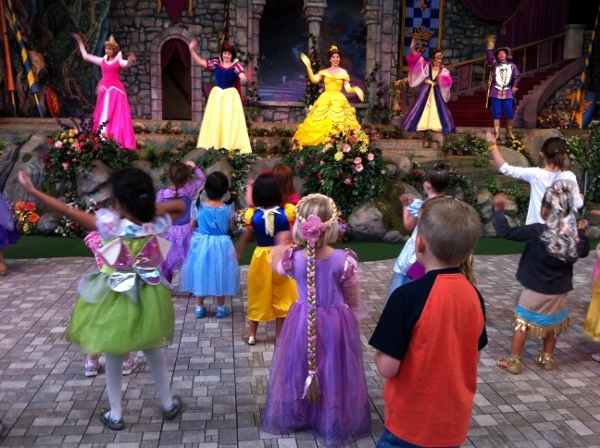 The Princesses are introduced to their Coronation guests and they assist in the lessons. The children are taught the proper technique to curtsy and of course, perform the proper wave. 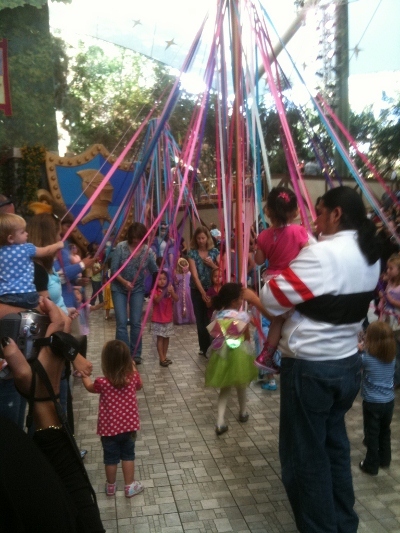 A quick dance lesson follows and then, at the end of the ceremony, the princesses and knights put their newly found talents to good use by celebrating the May Pole dance with each of the Princesses. It’s a bright and colorful ending to a charming show. 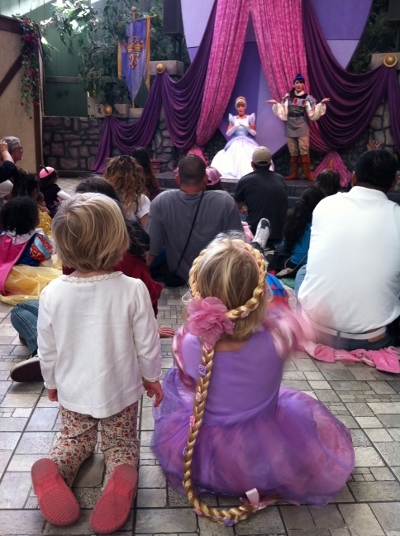 After the activity of the Coronation, families can relax and gather around one the Disney Princesses for Storytime. There, they will hear that Princess tell her famous story, with the aid of a Page. While these are the same stories that are broadcast on the Resort’s Hotel television at nighttime, there is nothing like catching them in person. 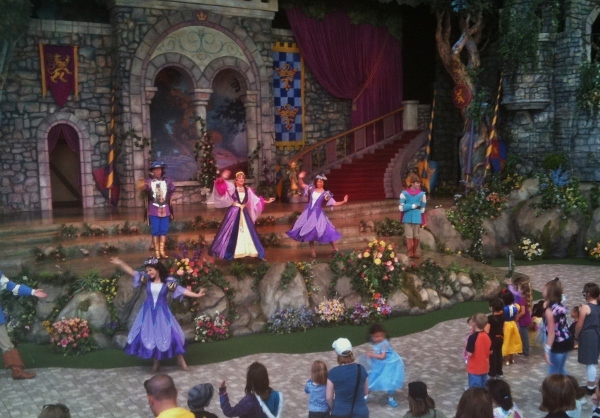 It’s a captivating way to end a very “Princess” kind of day!